With all the hype during flu season, and the recent Ebola "crisis", we thought it would be interesting to find out what kinds of microbial contamination are lurking inside our country's hospitals. Some of the tests checked for bacteria, and some checked for mold. The top 5 bacteria, as reported by an accredited lab, are listed below. The photos are of mold and/or bacterial colonies found in this air conditioner. You might think the air conditioning units that filter, cool and heat air into an operating room would be pristine, but that is almost never the case. The scary reality is that most air handlers are rust buckets and leak like sieves. We replace old air handlers for a living, so we have seen some of the oldest, dirtiest and rustiest air handling units you could imagine. In fact, we chose the cleanest, best looking unit in this section of the hospital from which to take samples. Portions of the unit casing had rusted through, allowing air to enter - or exit - the air handling unit. 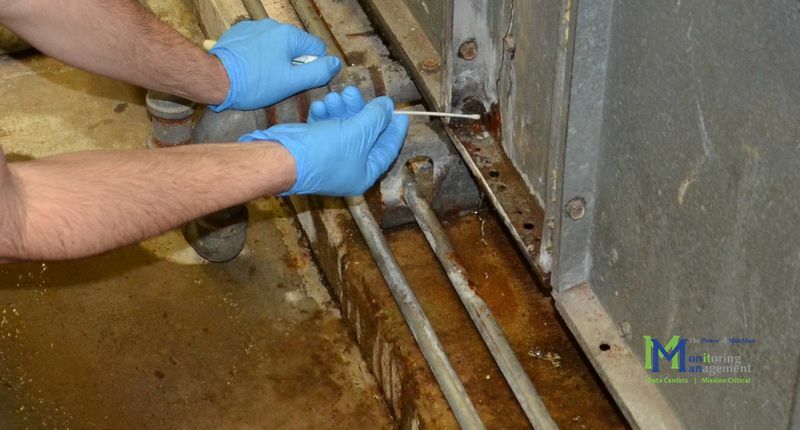 In this photo, we are holding the swab at a rusted through hole which was allowing air and water to leak out of the unit. 1) Alcaligenes faecalis: As its name implies, it was first discovered thriving in feces. It's scary to know it's living inside an air conditioning unit. It's actually a fairly harmless bacteria, but it can cause urinary tract infections. And besides, found in feces? Gross. 2) Leifsonia aquaticum: If you thought bacteria found in poop was weird, how about this one? 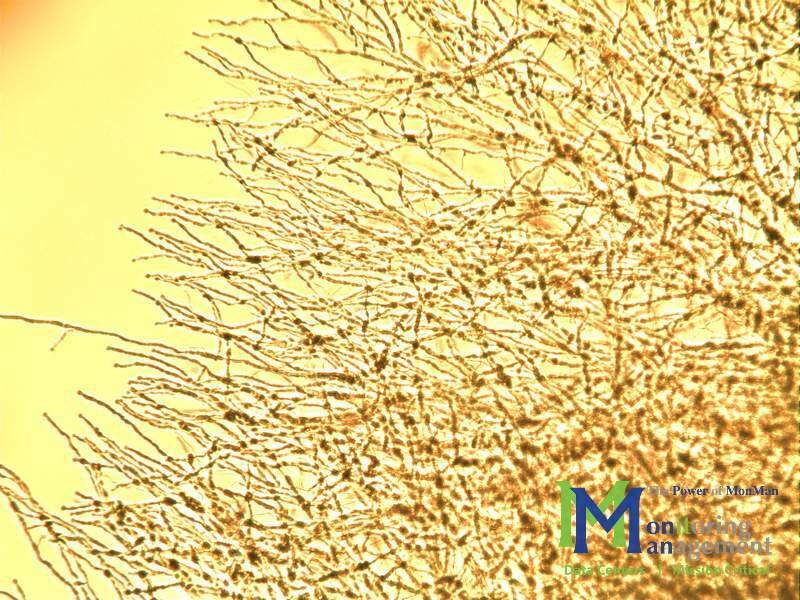 Leifsonia bacteria are typically associated with infections of sugarcane. So how exactly did it get into the ventilation system of an air handling unit? While it is not exclusively found in sugarcane crops, it does thrive in warm, moist environments. When it's not ruining crops, it can sometimes infect humans and cause endocarditis, meningitis, peritonitis, and urinary tract infections. In severe cases, it can lead to sepsis, organ failure and death. This contaminant was isolated from the return air stream (air being pulled from the operating room back to the air handler). 10x magnification. 3) Pseudomonas oryzihabitans: Ok. Pseudomonas. That rings a bell. Now it seems like we're getting into familiar territory. While this particular little bug isn't as harmful as some of its Pseudomona brethren, it is an opportunistic bacteria that can infect immuno-compromised patients or people using catheters or IVs. This bacteria is still relatively easy to treat with many types of antibiotics, but it has developed resistance to some very common penicillin-like antibiotics including ampicillin, amoxicillin-clavulanic acid (Augmentin), and even cefazolin (a powerful cephalosporin type drug). The part we need to pay attention to, however, is that this is an opportunistic bacteria that can quickly take hold in immuno-comprimised patients (AIDS, Leukemia, etc. ), and is readily spread while patients are hospitalized and especially during surgery. Did I mention we found it in the air conditioner that blows air into an operating room? This image is white mold we cultured in a Petri dish. We took the sample from inside the air handling unit, on the downstream side of the HEPA filters. (This white fuzz was growing after the point HEPA filters should have filtered any mold spores.) 10x magnification. 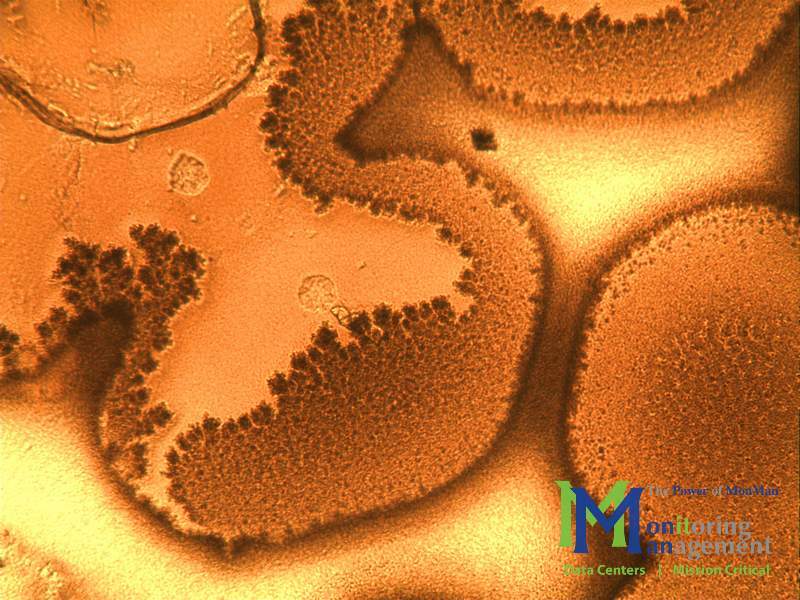 4) Methylobacterium mesophilicum: This is one of the two most commonly found bacteria in clinical samples. It is especially harmful to immuno-compromised patients, like those found in a hospital operating room. Methylobacteria have been reported to exhibit resistance to chlorination and have been isolated from tap water in various clinical settings including: an investigation of a pseudo-outbreak, water from dental units, and blood purification units. Tap water is a suspected mode of transmission. The presence of these organisms in tap water prompted suggestions that it may be helpful to monitor these organisms in water distribution systems in hospital units for immuno-compromised patients. 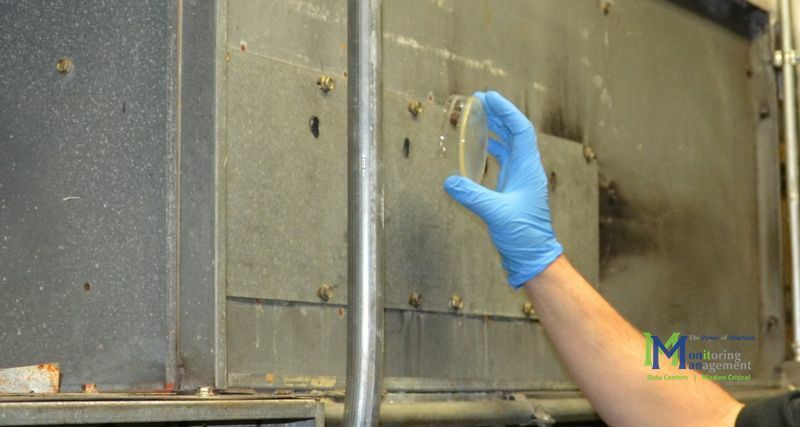 How did this bacteria make its way into the ventilation system that serves an operating room? Perhaps more importantly, how could it be eradicated, given its resistance to chlorination? 5) Pseudomonas putida: Ok, this one is just weird. It's not especially infectious or harmful to humans, but it has the most interesting story of them all. This bacteria was the first genetically-modified organism to be patented. That's right, Ananda Mohan Chakrabarty, a genetic engineering researcher for GE, invented this bacteria (or a close cousin, based on this bacteria) and even won a court case against the commmissioner of the U.S. Patent & Trademark Office which gave him a patent on it. Now, in the past, this bacteria has been called the "oil-eating" bacteria, because it can biodegrade many types of substances including oil, solvents and even caffeine. This type of research was conducted in the 1960s and 70s. More recently, however, this, and other similar bacteria, have been used in genetic engineering research for various purposes, including cancer cell regression, genetic therapeutics and arresting cell cycle progression. Genetic engineering based on this bacteria is ongoing not only at several labs around the world, but at a few select hospitals in major metro areas. This little bug could possibly cure cancer or even slow the aging process. How did it end up here, in the operating room of a hospital in one of the largest cities in the United States? So, How Can We Improve the Conditions in Our Hospitals? In some cases, taking samples is quite easy, since the air conditioning units have a surprisingly high number of leaks and holes. 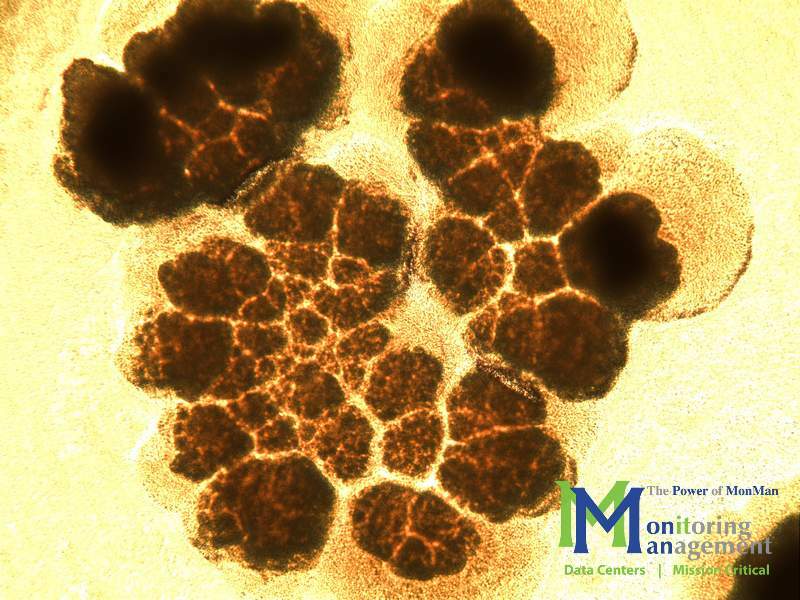 Exposing a Petri dish to high velocity air leaking from the air handler is a simple method not requiring specialized equipment. We also took samples from inside the ductwork and air handler. Hospitals have been called one of the safest places to be, because if anything happened to you, you'd be right there with the nurses and doctors who can take care of you. Unfortunately, the reason we have to go to hospitals in the first place is because we are sick. So while hospitals are the best place to get all sorts of treatments, they're also a breeding ground for all the microbes that hitch a ride on the patients. The company I work for, MonMan, is deeply involved in the healthcare industry, and we've improved the cleanliness of many aging HVAC systems. One way to do this is to keep the ductwork clean, but sometimes, the air handler itself is the problem, and needs to be changed out. You can even add UV-C disinfection systems to help kill microbes in a hospital's ventilation system. But in a sense, it comes back to a basic truth: we each have to do the best we can, and the rest is out of our control. Despite all of our advanced medicine, technologies and techniques, we don't always know what is lurking around the next corner. In the meantime, wash your hands, cover when you sneeze, and the next time you're on the operating table, hope your hospital has a clean ventilation system. If you'd like to know more about our study, please see the full version of this article. Copyright Notice: All text, intellectual property and images in this article are the sole property of Monitoring Management (MonMan). For questions regarding licensing or use of this material, please contact us. Unauthorized use or redistribution will be considered a violation of copyright law. Basically, if you'd like to use this information, please ask us, and be sure to cite us as the source and link back to this article. Thanks!